Cutouts are people or procedures that enable political operators to communicate in safety. Using cutouts, operators can manipulate their environments while limiting their personal risk. How can you detect cutouts? And what can you do about them? 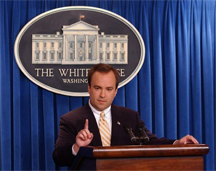 Scott McLellan, White House Press Secretary, 2003-2006. The President's Press Secretary often acts as a cutout. If a statement creates trouble, the Secretary is the one who misspoke or who had incorrect information. This practice is not specific to Mr. McLellan's boss — all modern U.S. Presidents have employed press secretaries in this way. Official White House photo courtesy Wikipedia. In espionage, a cutout acts as a secure means of communication. Its security usually derives from an asymmetry in its connection to the larger system. That is, while the people who communicate through the cutout know how to send messages to the cutout and how to receive messages from the cutout, the cutout probably doesn't know how to contact the communicators. A "dead drop" can be an example of a cutout. Another example: a courier who doesn't know the source of the freight carried. Cutouts also play roles in organizational politics. Here are three examples of cutouts or their use in the workplace. By simply making information available in a deniable way, an operator might encourage an ambitious subordinate to pursue a project. The disclosure might be something as simple as an apparently careless exposure of a memo on a desk or screen. The subordinate receives the information, but cannot reveal its source, without seeming to be a snoop. Ambiguous direction creates a chance that subordinates will do what the operator wants when the operator cannot ethically direct the subordinate to do so. If ever a problem arises, the operator can assert that he or she had something else in mind, and that the subordinate initiated the ethical breach. When combined with subjective cues, such as facial expressions and knowing glances, especially when delivered in private, ambiguous directions are especially effective. Typically, human cutouts deliver or leak information on behalf of their operators, but they're unwilling or unable to credibly reveal sources or other related information. This protects the operator when the information leads to undesirable consequences or to pressure to reveal more. If the ploy backfires, then the operator can assert that either the human cutout misspoke, or exceeded authority, or any of a variety of other insulating claims. When you spot a ploy that could be a cutout, what can you do? You might be content to receive the information through the cutout. This is a risky approach, but always a possibility. Ask for a direct disclosure instead, especially if you're receiving ambiguous direction. For instance, "You certainly wouldn't want us to act unethically…do you mean X or Y?" If you receive information that you "shouldn't" have, ask about it directly. "I've heard that Marigold might be revived. Know anything about that?" The operator now has a stark choice: to deny, to lie, to decline, or to reveal. If the information is revealed in front of witnesses, you're safe. If the operator continues to withhold, or dissembles, you might have found an accidental slip. Otherwise, take care. Would you like to see your comments posted here? rbrenaNpayBOOxYerhbMSner@ChacTDKasaIRhmEoAPNIoCanyon.comSend me your comments by email, or by Web form. Among the most futile and irrelevant actions ever taken in crisis is rearranging the deck chairs of the Titanic, which, of course, never actually happened. But in the workplace, we engage in activities just as futile and irrelevant, often outside our awareness. Recognition is the first step to prevention. People who behave narcissistically tend to regard themselves as special. They systematically place their own interests and welfare ahead of anyone or anything else. In this part of the series we consider how this claimed specialness affects the organization and its people. I offer email and telephone coaching at both corporate and individual rates. Contact Rick for details at rbrenBXgjhZUciYnVTapCner@ChacQffDtmHXCYIHlUkLoCanyon.com or (650) 787-6475, or toll-free in the continental US at (866) 378-5470.